One of the things I had to do all the time in teacher school was work in a group. Words cannot adequately describe how much I detested group projects. I tried to always rig things so I had one friend in the group to make sure we could get all of the work done. It was almost a certainty that the other people in the group were going to be slackers. That may sound condescending, but I assure you, there were far too many late nights where I scrambled around trying to get things done that were supposed to have been done by other people. The reason there were so many group projects assigned in teacher school is that we were learning how important and useful group projects would be for our students. I didn’t think (and still don’t) that putting kids who worried about getting everything just right in groups with kids who absolutely did not care was fair. The logic is that in the workplace, most work is group work and that students need to learn how to cope with the slackers. They are going to need that skill when they have jobs. I don’t know about all that. My own experience in the workplace was almost as bad as my experience doing those much-hated group projects in teacher school. After all of that, it is probably no surprise to learn that on the scale from introvert to extrovert, I land way over in introverted territory. That’s one of the reasons working at home is so appealing. Simply being around lots of people (as in an open office) drains my energy. And so I decided long ago that being a hermit could be the perfect lifestyle. Then, I discovered the joys of collaboration. It was accidental, this discovery. First, I found myself working as a collaborator with many of my clients. They would share their ideas, I would ask about their goals, then I would produce some copy, talk with them about changes they’d like to see, and finally come up with something they loved. We worked together – they gave me ideas, I gave them copy. Then, I read about how Sean Platt and David Wright collaborate as writers. (I have just finished Season Two of Yesterday’s Gone, and highly recommend it!) While I have collaborated on lots of client work, it never occurred to me that it could work on a creative level as well. Their work is proof that it can, with the right combination of talent and personality. Now, I am working with a partner on a new project, and it is going so well we have started a second project together. As it turns out, collaboration can be lots of fun and very productive, even for introverts – if you find someone you trust. If you are enjoying the Independent Writing Series, make sure to check back on Thursday, because there will be an interview with writer Joanna Penn! 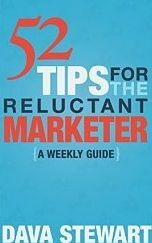 Buy 52 Tips for the Reluctant Marketer!